When S. Wallace Edwards started selling ham sandwiches on the Jamestown-Scotland Ferry, he realized just how desirable cured ham products were. Soon thereafter, Edwards began his business. Edwards built his first smokehouse in 1926 and the business began to boom with his first product, the wigwam brand ham. As the business continued to grow, so did the Edwards family with the birth of S. Wallace Edwards, Jr. in 1930. Over the next few years, the family business would add additional smokehouses, develop smoked bacon and sausage, as well as work on perfecting the pork curing process. Edwards is a family business in the true sense, with not only S. Wallace Edwards, Jr. taking over the business, but aunts, uncles, cousins and wives all contributing to the success of the business. Sam Edwards III was born in 1956 and continued in his father and grand-father’s footsteps. He started working in the smokehouse at an early age and continues to work there today along with his son, Sam Edwards, IV. Edwards Smokehouse products have grown from the wigwam ham to include Surryano ham, bacon, sausage, a variety of other pork products and most recently, a dry cured lamb. 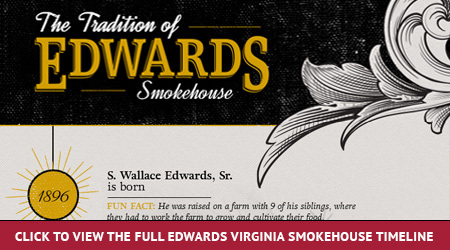 Read on to experience the full history of Edwards Smokehouse.